The Stark Raving Viking: Did the FBI bomb the World Trade Center in 1993? This is a World Trade Center tower in the process of being built, probably in 1968. This type of "over-building" a building would not result in it "collapsing" into itself almost no matter what, unless helped. If the FBI was responsible for supplying the bombing materials, the plan for bombing the World Trade Center buildings, for one to topple on the other, finding patsies to do the job, wouldn't they try again, AND be up to other black bag operations and citizen abuse? 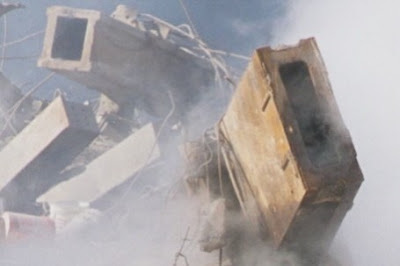 Massive, thick, and redundant steel beams don't just melt into the ground at free fall speed unless explosives and metal melting chemical compounds are used. There was very little concrete used as compared to steel used in the New York City World Trade Center buildings, imploded and demolished, September 11, 2001. Steel dust, carpet dust, paper dust, human remain dust, etc. finer than sand was blown all over Manhattan, New York. The above photo of dust and the three above that were [found here]. "... 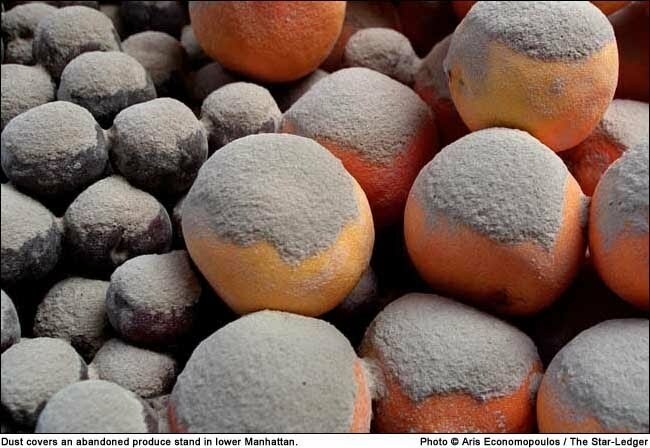 The picture below shows an example of that fine microscopic dust that covered all over Manhattan after the WTC demolition. Many people mistakenly believed that it was allegedly "concrete dust". No, it was not. It was "complete" dust - mainly pulverized steel. 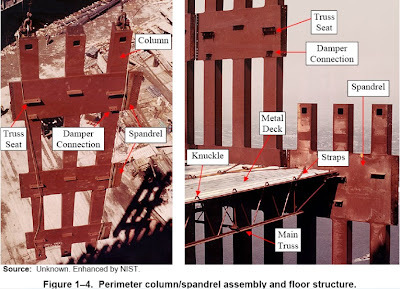 Despite common misconception, the WTC structures did not contain much concrete. 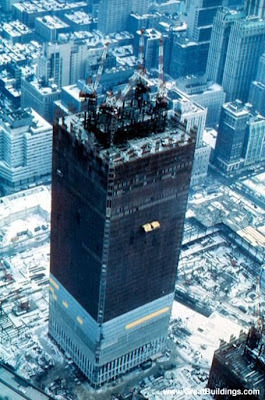 Concrete was used only in some limited quantities to make very thin floors slabs in the Twin Towers construction. It was not used anywhere else. The major part of the WTC Twin Towers was steel, not concrete. So this finest dust was in its major part represented by steel dust accordingly. Though, it was not only "steel dust" alone - it was also a "furniture dust", "wood dust", "paper dust", "carpet dust", "computer parts dust" and even "human dust", since remaining in the Towers human beings were pulverized in the same manner as steel, concrete and furniture." In this audio recording of Emad A. Salem in conversation with one of his FBI handlers, Special Agent John Anticev (recorded unbeknownst to him), Salem admits a number of times to building, with the supervision of the FBI and the District Attorney of New York, the bomb that exploded in the North Tower (Tower One) of the World Trade Center on February 26, 1993. FBI Special Agent John Anticev doesn't disagree with Salem's account of the event, and indeed Anticev admits in the recording that Salem has only ever told him and the FBI the truth. Salem says in the above that he and the FBI built the bomb, i.e., "we." Indeed, he says it three different times here in three different ways: first he says "we [i.e., at the very least Salem] was start already building the bomb," then he says "It was built by supervising supervision from the Bureau and the D.A.," and lastly he asks "By who?" (i.e., "By whom was the bomb built?") to which he answers "By your confidential informant" (i.e., by Salem). Salem was a former Egyptian army officer and the explosives expert within Sheik Omar Abdel-Rahman's circle of followers. The fact that Salem was the explosives expert and bomb-builder within Sheik Rahman's circle is further reinforced by the fact that Salem tried to get the FBI to allow him to secretly substitute harmless powder for the explosives, but the FBI wouldn't allow it (see the two New York Times articles I previously cited above for that). Let me repeat: Salem himself wanted to substitute harmless ingredients for the bomb. What this demonstrates is that (1) Salem was regarded within Sheik Rahman's circle as the bomb-making expert (such that Salem would be allowed by them to be in charge of building the bomb), and that (2) Salem wasn't all that concerned about anyone else within Sheik Rahman's circle knowing the difference between fake or real bomb-making ingredients. Nor can point No. 2 be dismissed as Salem not being very cautious, because not only was Salem concerned enough about his dealings with the FBI to secretly record his phone conversations with them (lest the FBI attempted to deny the extent of their relationship with Salem and blame him for the bombing), but Salem also refused to wear a "wire" in case he should be discovered as an undercover agent. In other words, if Salem thought that there was anyone else within the circle that he infiltrated who would know the difference between fake or real bomb-making ingredients then he wouldn't have been at all keen--as he indeed was--on the idea of substituting fake bomb-making ingredients. There is simply no getting around the fact that Salem was the one who built the bomb under orders and supervision of the FBI. Not only did Salem say three different times in three different ways that he and the FBI built the bomb, but then one has points Nos. 1 and 2 which demonstrate that Salem was in charge of bomb-building within Sheik Rahman's circle, and that no one else within this group besides Salem would have been able to recognize fake bomb-making ingredients. One reason for me bringing up the above exchange is that it once again, at the very least, demonstrates that Salem was in charge of bomb-building within Sheik Rahman's circle. And depending on how one interprets the phrasing, it could very well mean that Salem is here saying that he had previously built a bomb for this group and hence "the guy will ask me [i.e., Salem] to build a bomb again": i.e., Salem had already built a bomb for this group, and now they're asking him to build another one for them. But at the very least this exchange further demonstrates that this group thought that Salem was the one to go to when it comes to having a person build bombs. Moreover, another point to me bringing up this exchange is that FBI Special Agent John Anticev here admits that Salem hasn't ever said anything false to him or the FBI. That is, Anticev here agrees that Salem's statements in the audio recording regarding how the February 26, 1993 World Trade Center bomb was built are correct. Sunday Edition of the alex jones show. In the course of the trial it was revealed that the FBI had an informant, a former Egyptian army officer named Emad A. Salem. Salem claims to have informed the FBI of the plot to bomb the towers as early as February 6, 1992. Salem's role as informant allowed the FBI to quickly pinpoint the conspirators out of the hundreds of possible suspects. Salem, initially believing that this was to be a sting operation, claimed that the FBI's original plan was for Salem to supply the conspirators with a harmless powder instead of actual explosive to build their bomb, but that the FBI chose to use him for other purposes instead. He secretly recorded hundreds of hours of telephone conversations with his FBI handlers; reported by Ralph Blumenthal in the New York Times, Oct. 28, 1993, secton A,Page 1. Jeez, you had to sully a perfectly good post with Alex Jones BS? And yes, the 93 bombing was a fraud, talk about entrapment. Israelis were the driving force behind both the 93 strike, OKC(tried to frame Iraqis for it but thankfully the FBI-or elements of it-did not go along with that) and 9/11, with traitor Americans taking the secondary role. Alex Jones wont tell you that though, he'll just blame the "NWO". I hear you on Alex Jones. He does sound partisan and one sided on many issues. His style can give you a headache listening. Even so, there are some interesting points made in his videos, and subjects that are interesting. Just because I post it, doesn't necessarily mean I agree, just that I find it interesting to post for debate. Life, Liberty, Pursuit of Happiness … All Crap? Bill Still's "The Secret of Oz"